ODIHR Election Reports: too soon, too late, or both? The Elections Observation Missions of the Office for Democratic Institutions and Human Rights of the Organisation for Security and Cooperation in Europe (ODIHR) have become a regular feature of the electoral process on the European continent, and a model for others world-wide. The Missions, consisting of a core team and a handful of long term observers deploy a month ahead of the poll and are joined for election-day by several hundred short term observers and delegations from the Parliamentary Assemblies of the continent’s leading institutions. Whilst not perfect, the ODIHR model remains the best. One feature that has often caused concern is the way that these missions report their findings. It has now been a long standing habit (it would be wrong to call it anything else), for the Election Observation Missions to issue two interim reports prior to election-day. They are often very technical in nature. On election day the Mission then joins up with the parliamentary delegations from the Council of Europe, the European Parliament, sometimes the NATO PA and until recently with the OSCE’s own Parliamentary Assembly, for the day-after Press Conference, usually held at 3.00 or 4.00 in the afternoon. This has traditionally been the most high profile part of the process. The atmosphere is usually highly charged, the journalists coming from overseas to cover the election would still be around, and everybody is waiting for the key phrase or phrases which would indicate that the election has been deemed free and/or fair, although in recent years the wording has become increasingly more ambiguous. The Parliamentarians then leave as quickly as they had arrived, and the ODIHR mission lingers on in-country for a while to observe the post-election environment. Rarely, as was the case in Armenia after the 2008 Presidential election and again this month, it issues a third interim report. The Mission then departs and two months after the Mission issues a final report. Sorry, you did not read the small print. For the fourth time in 17 years, a defeated Armenian presidential candidate has openly denounced the outcome of the ballot in a presidential election as rigged and declared himself the legitimately elected president. 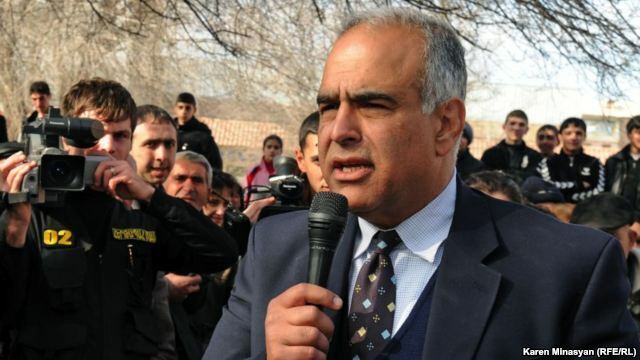 Raffi Hovhannessian last week took his campaign to overturn the result of the 18 February Presidential election to the regions of Armenia where he was given an enthusiastic welcome. (picture courtesy of Radio Free Europe/Radio Liberty). The ODIHR Election Observation Mission monitoring the Armenian Presidential Elections took pundits by surprise by issuing a third interim report before they packed their bags and left Yerevan on 4 March. ODIHR Missions do not always issue third reports, although as was the case with the previous Presidential election in Armenia in 2008, they sometimes do. Armenian political analysts detected a change of tone in the 3rd ODIHR interim report – a somewhat more critical appraisal of the 18 February Presidential Election than the more upbeat assessment emerging from the Press Conference of the international observation missions on 19th February, which triggered a flood of congratulatory messages to the incumbent Armenian President from world leaders. The 3rd monitoring report for example states that, “An OSCE/ODIHR EOM analysis of official results shows a correlation between very high turnout and the number of votes for the incumbent. This raises concerns regarding the confidence over the integrity of the electoral process”, which is diplomatic parlance for saying that they suspect that there was ballot stuffing on an industrial scale.